Adaptive Control involves modifying the control law used by a controller to cope with the fact that the parameters of the system being controlled are slowly time-varying or uncertain. It is an active field in the design of control systems to deal with uncertainties. Adaptive Control is roughly divided into two categories: direct and indirect. 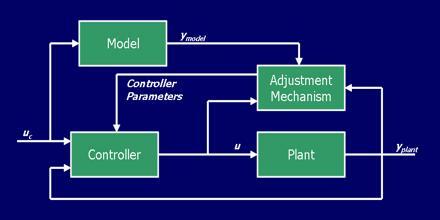 Indirect methods estimate the parameters in the plant and further use the estimated model information to adjust the controller. Direct methods are ones wherein the estimated parameters are those directly used in the adaptive controller. It is the automatic monitoring and adjustment of machining conditions in response to variations in operation performance.